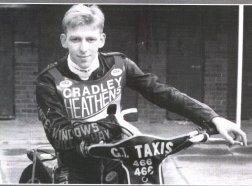 Steve Knott signed for Cradley at the beginning of the 1995 season on loan from Sheffield and quickly became a hugely popular rider in a season of encouraging progress. The bottom end of the Heathens team had been remodelled after enforced changes to fit under the points limit. The two new reserves were very much unfancied amongst the experts as Knotty lined up alongside 16-year old debutant John Wilson. But the two were to prove wrong some of the doubters and turn a few heads along the way. Steve was born in Lincoln and became the mascot at local track Boston in his early days. He then moved on to the junior setup at Sheffield where he showed enough promise to eventually break into the first team in Division Two. However, after his progressed slowed down a little, it was time for a move and the Cradley management snapped him up. Still relatively unheard of, Knotty started the season with an assessed average but didn't take long at all to find his feet at Dudley Wood. It was his constant determination which earned the respect of the fans but it was his Gary Lineker sized ears that earned the affectionate nickname of 'The FA Cup', a chant which would regularly reign from the terraces during Steve's better performances! He scored four points on his debut in the annual season opener against Wolves, and was soon clocking up regular scores of five and six at home. There was the added pressure of being first reserve, even with his relative inexperience, due to partnering the even less experienced Wilson, but the two began to impress. After the club started the season without too much hope of points from the reserves' second heat outing, it wasn't long before Knotty and Wilson were trapping confidently and outpacing many of their more experienced opponents. By the summer, there were scores of 7+1 against Poole, 7+3 against Bradford and his best away return of 8 from 6 rides at Sheffield. The only knock was a hip injury, sustained in heat two of the Knock Out Cup Semi-Final against Belle Vue, which forced him to withdraw from the meeting. Significantly, it goes down as the only time he failed to score in an official match. Such was Steve's improvement, he was signed on a full transfer before the fateful 1996 season at Stoke and everything seemed rosy. Unfortunately, it was the worst possible start to the campaign at Loomer Road as he was injured in the first match against Wolves. After missing four matches with the ill-timed injury, Knotty returned with no home track advantage and already being left behind as the whole team adapted to the new location. After completing only five league matches, he was dropped from the 1-7 to be replaced by Les Collins, in a bid to strengthen the team. After being unable to find another team place, he drifted into a temporary retirement before being tempted back into the saddle by former club Sheffield. He retained his place in the Tigers Premier League line-up for a while, but despite a string of good personal performances, he was unlucky to be dropped again in slightly controversial circumstances to make way for new signing Robert Larsen. He has once again drifted out of the sport.